On March 18, 2018, Russians reelected President Vladimir Putin by a huge margin. Official reports say that 67 percent of voters went to the polls and that 76 percent of those supported the incumbent. This result comes as zero surprise, and media coverage has focused on the lack of true opposition candidates and allegations of ballot-stuffing. But there is more to this story. About 800,000 poll workers at more than 95,000 polling stations across Russia delivered basic administrative services for this election. This army of street-level bureaucrats verified voter identities, issued/counted the ballots and established the voting tallies at each precinct. How did Sunday’s election look, behind the scenes? We tend to assume that poll workers, whether they are in South Dakota or the Northern Caucasus, are professional and independent. Put simply, we expect poll workers to leave aside their political biases and ensure that voting takes place according to fair and impartial procedures. And we tend to believe that polling commissions — whose job is to organize and manage elections properly — should include representatives of different parties. This makes for balanced monitoring and control, which helps diminish voting manipulation and election fraud. On the basis of data about poll workers that we collected and analyzed, a number of reasons exist to be doubtful that Russia’s election commissions were balanced and unbiased. We spent several months monitoring the composition of precinct commissions before the 2018 election. We used official data disclosed by the Central Election Commission of the Russian Federation. 1. Many poll workers probably came under pressure to manipulate the voting process and voting tallies. Russia’s political parties, gatherings of voters and civic organizations nominated about 385,000, 355,000 and 65,000 poll workers, respectively. These figures tell little about the exact political affiliations of poll workers, but they shed light on mechanisms for recruiting commissioners. And the “gatherings of voters” is the most voluminous and electorally sensitive mechanism of poll workers’ mobilization. The vast majority (nearly two-thirds) of the 355,000 poll workers from this category were recruited from their workplaces. Many are “bjudgetniki” (from the word “budget”) — workers who get their salaries from the state. Thus, teachers, local bureaucrats and administrators, service members and workers at state enterprises are particularly vulnerable to administrative resource, a form of political coercion. 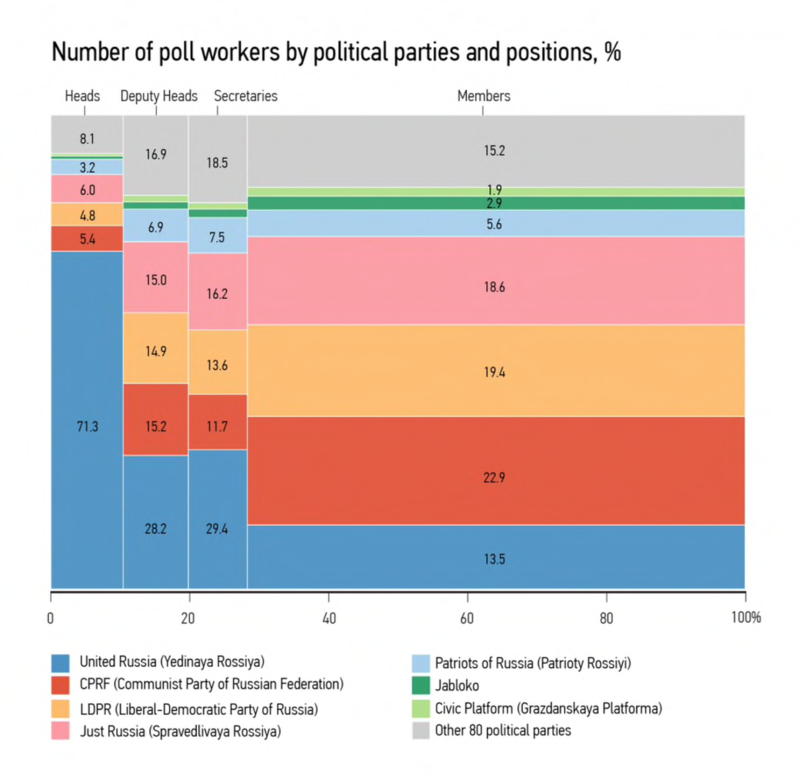 Breakdown of Russia’s party-nominated poll workers. The data suggest parties that backed Vladimir Putin held disproportionately more positions as election commission heads, deputy heads and secretaries. Data source: Central Election Commission of the Russian Federation. This means their bosses — higher-ranking school administrators and bureaucrats, heads of enterprises and commanders — can either push them to commit illegal actions, electoral manipulations or fraud. Or they can calm poll workers who see these actions at their precincts and might think about reporting the irregularities. 2. Putin supporters occupied 1 in 3 electoral commission head positions. More than 60 political parties recruited 385,000 poll workers. And the vast majority of the electoral commissioners were nominated by political parties that got seats in the December 2016 Duma elections. Among them, the governing United Russia party and ally Just Russia both supported the candidacy of Putin in 2018. These parties control a combined 37.5 percent of party-nominated commissioners. Heads of commissions, in particular, possess more powers, influence and discretion than regular poll workers: Whoever has control over the commissions’ officers also has more control over the commission in general. And this is exactly what we observed in the selection of Russia’s commission heads. More than 38,000 of these heads were recruited from the gatherings of the voters’ nominees, which means a large portion of them are, therefore, more vulnerable to administrative pressure, mainly at their workplaces. An additional 28,000 commission heads were recruited from United Russia, which, by itself, controls twice as many commission heads as all other parties combined. What does this mean on the ground? Basically, every third head of a polling station commission in Russia was nominated by United Russia, which backed Vladimir Putin. 3. 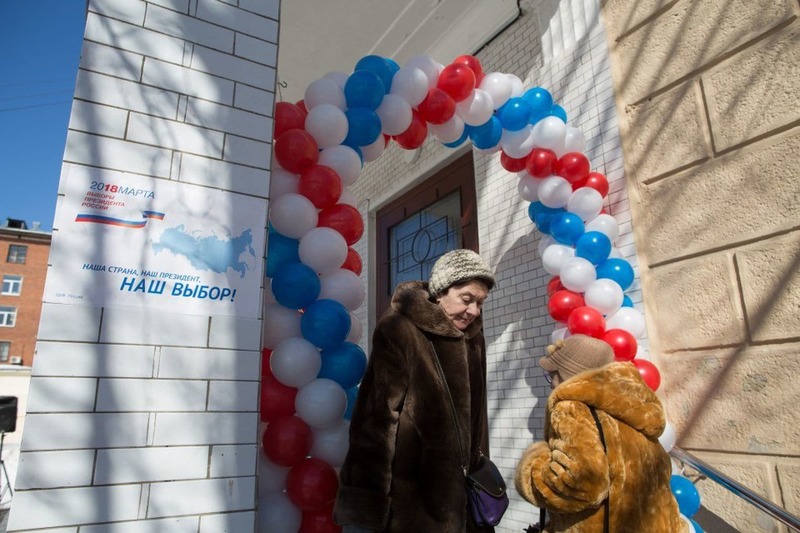 A closer look at Crimea’s poll workers shows many newcomers. This was the first time that voters in Crimea cast ballots in a Russian presidential election since Russia occupied the peninsula in 2014. In our analysis, we compared the composition of poll workers in Crimea for the 2018 election with the poll workers from the last election, held in 2012 under Ukrainian rule. We found that fewer than 20 percent of the 2012 poll workers were signed up to work in 2018. This suggests that the new regime has extensively substituted new poll workers for previous election administration personnel. Considering the absolute number of people needed — more than 14,000 commissioners — the Russian administration in Crimea seemed to set up an efficient system to recruit poll workers. What do all of these findings suggest, then? Taken together, they paint a picture of the many ways that the Russian regime can control what happens on election day. By filling election commissions with poll workers who depend on the state for their livelihoods, integrating representatives from the parties that actively backed the Putin regime, and controlling officer positions — mainly heads of the commissions — the story seems straightforward. Nazar Boyko is a co-founder of the CIFRA Monitoring-Analytics Group, a Ukraine-based nongovernmental organization founded in 2009; a PhD student at West Virginia University; and a Fulbright alumnus (2008/2009). Roman Sverdan is CEO of the CIFRA Monitoring-Analytics Group, head of DIAGRAMMM Project, and a Fulbright alumnus (2016/2017).